With our potato crop not doing well this year, we did not get enough potatoes to last us until next year, first time in ten years, I bought instant potatoes and the dried sliced potatoes in boxes. First lesson, when trying something new with your family, only buy 1 box, (I bought 10). The sliced potatoes(with cheese, seasonings, etc.) I fixed twice, the dogs would not even eat them. And I even doctored them up, adding more seasonings. They tasted awful to us. I know some of you really like these kinds of potatoes, but after you have lived on real potatoes for years, these are really awful, and that’s being nice. As for the instant mash potatoes, well we can eat them if I add enough butter and cream to them. 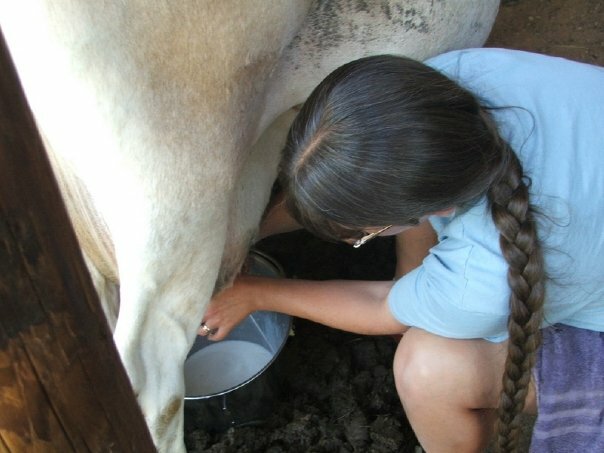 I know you are supports to add milk, but I have a lot of cream, and the cream helps them taste better. Store bought food is not looking good, we may not eat our usual amount of potatoes this winter. Tommy says it’s my fault they will not eat these things as I have spoiled them with fresh home grown foods. Now it’s my fault, what am I to do? Having to stay in the house to watch and listen for Tommy, I have knitted 2 pairs of house socks and working on my third. I cut a set of queen flannel sheets into 10″ squares to use as tissues and napkins. Second lesson, that’s a lot of hemming to do. 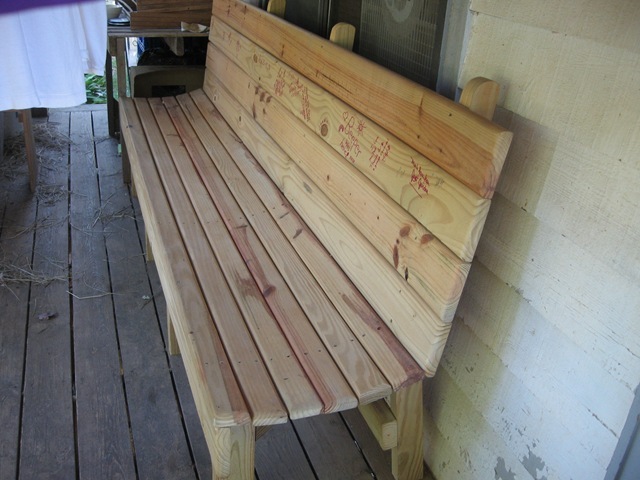 And don’t think you can get it done in one day at the kitchen table. This is not possible, the sack is very tall, and took me a whole day just to cut them out. Third lesson , the harder you try to be quiet, the more noise you make. This goes for old and young alike. Fourth lesson, don’t try and feed your family store bought cakes or cookies, even if they are given to you. They make funny faces and weird sounds and want to know what they did wrong. Last lesson, don’t spoil your family as this makes it really hard on you. An easy night in the kitchen is 1 hour instead of 3 hours. So much for store bought. Please don’t get me wrong, I love my family and love cooking for them, and will keep doing so. And at times I think twice about making something new from scratch as I know I will then always have to make it from scratch. But I keep doing it, just to see the smiles on their faces, and their big belly’s. I really enjoy the way we live. To me it’s the best for all, a little work, a little good food, a little fresh air, a little fun, a lot of smile, a few tears, lots and lots of prayer, a little rain, a little sun, a lot of great friends. Boy, life is good, and God has blessed us all. Well I better get this day started and see what I have to get into. P.S. As an award to my family for having to eat store bought goods, I have to make a pineapple upside down cake today. Oh what a hard life I have. 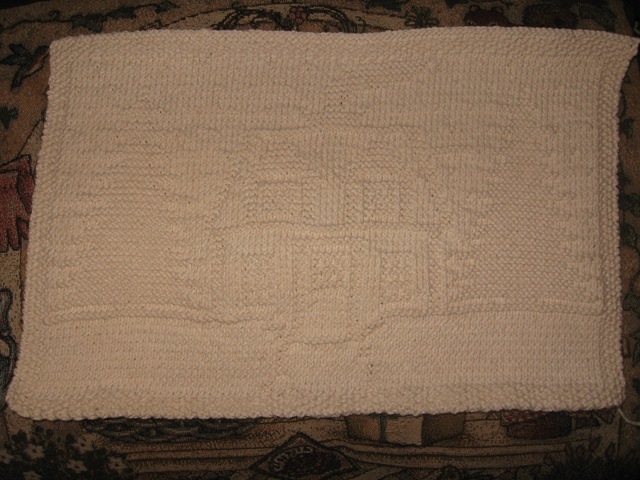 This is a knitted oven door towel. 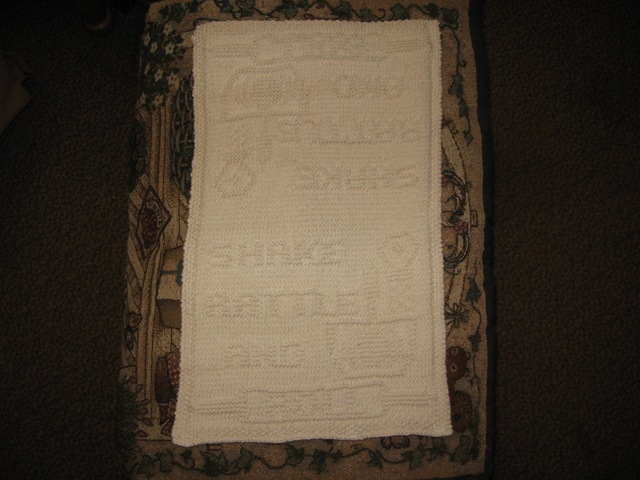 “Shake , Rattle and Roll” Pattern can be found HERE . 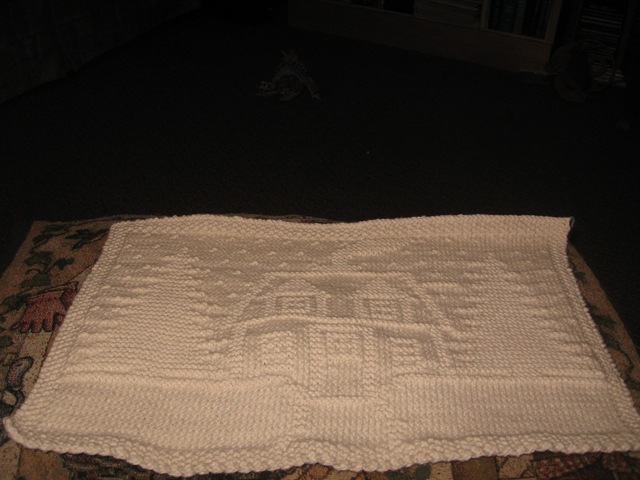 A knitted placemat, and pattern found HERE . 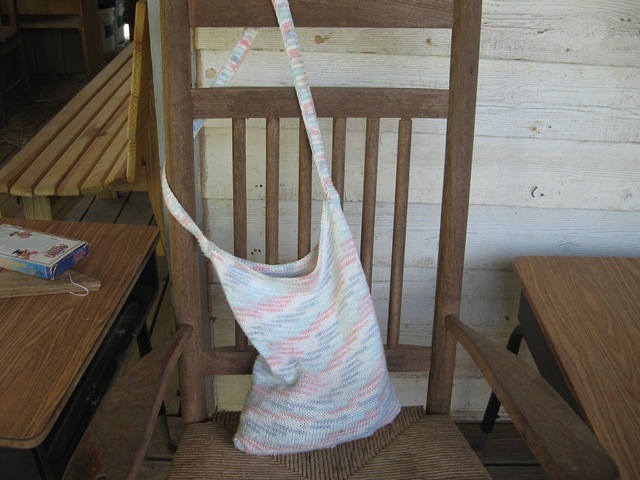 Rachel’s Knitting Corner Blog has a lot of patterns for sale and free patterns, too. A great site. Knitted dish clothes. These were really fun to knit. The patterns were free on line. 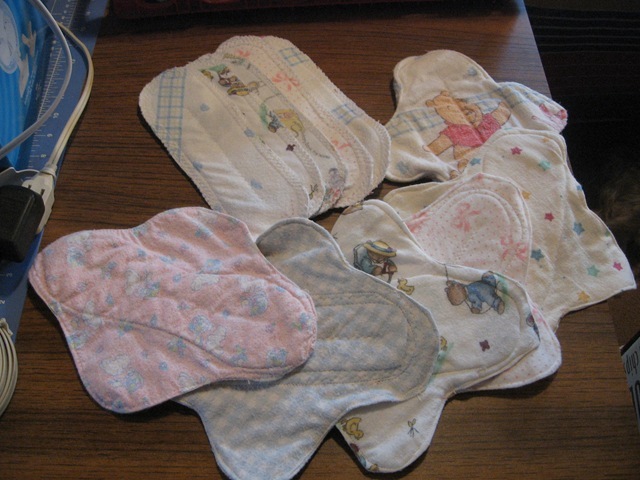 Here are a few of my home made pads. 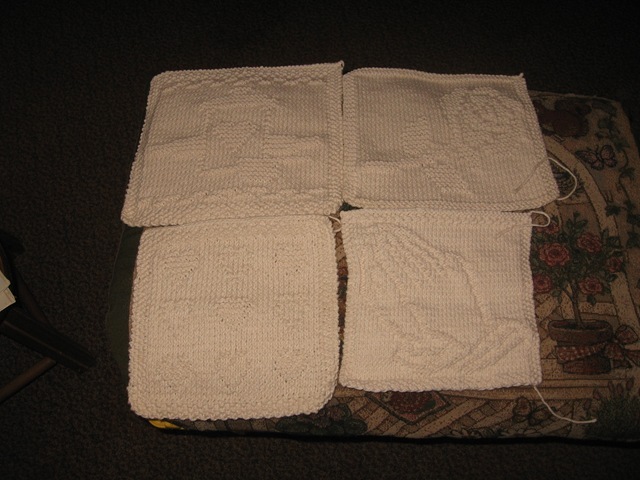 I used flannel baby blankets from the thrift store, 25 cents a blanket and each one made two pads. 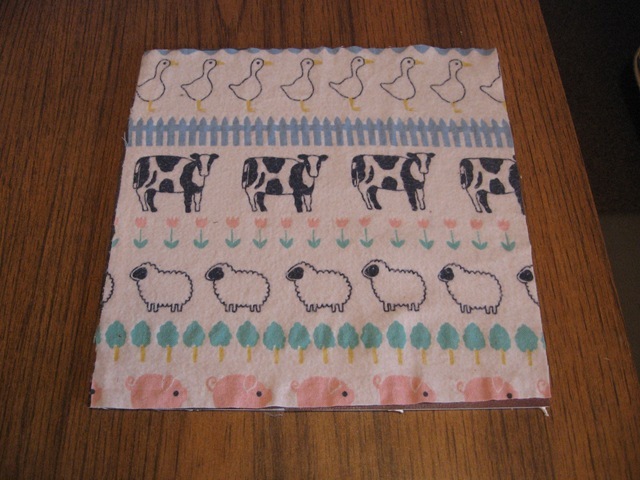 This was a flannel king size fitted sheet for $1 , and is now going to be napkins. This is a knitted clothes pin holder. 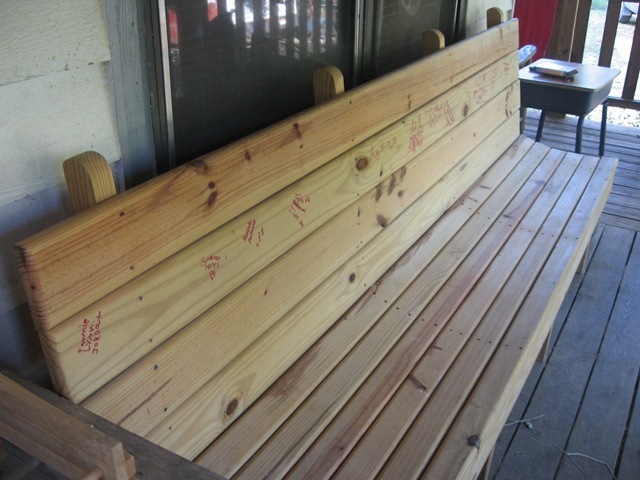 This is the 8 foot bench that Tommy made for the kitchen table, to hold all of our family. They all signed it before they left. It’s heavy and takes two big men to move it.